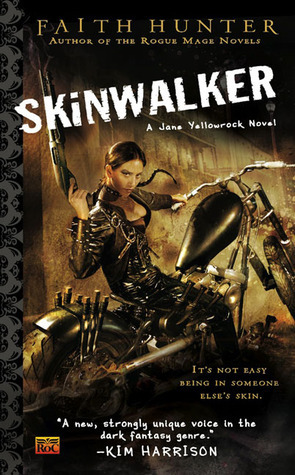 In the second book of the Jane Yellowrock series, we start off scant days after the concluding events in the first installment, Skinwalker (Jane Yellowrock, Book 1), and follow along with Jane as she takes up the reins of her second contract for the New Orleans Vampire Council, to hunt the vampire making and leaving new-rogue vamps all over the place. This hunt risks more than even Jane and Beast may be able to survive when vampire politics, witchcraft, and the shrouded mystery of the Mithran origins all start to coalesce into an insidious pattern and may be the driving force of the unknown assailant's master plan. After Skinwalker, a thrilling debut novel with original characters and an interesting twist on vampire mythos, I found Blood Cross to be slightly disappointing. not that I didn't like it, because I did, but I didn't love it like I loved Skinwalker and parts of Blood Cross felt unnecessary. I also noticed a bit of a difference in character between books - Jane in particular, but also Rick (The Joe from Skinwalker), though in his case to a much smaller degree. 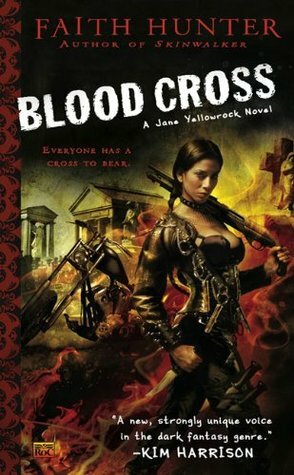 Blood Cross started strong, dragged a bit in the middle, and ended strong. The pacing problems were most notably caused by an excess of historical and mythological information that comes out in the middle of the book. It might have been better served had it been broken up between books a little more, especially the parts that didn't directly affect the particular underlying plot of this book. I was left feeling that while Skinwalker was a mad, dangerous dash towards a deadly finish line, Blood Cross got off to an incendiary start, but languished behind centuries of Native American skinwalker and Mithran mythos before picking up the pace again. Jane's cleansing and going to water were fascinating glimpses of Native American culture, and the plot threads with Bethany and Sabina were illuminating and brilliantly written from an originality of mythos standpoint, but they weren't largely helpful for the book's pacing and didn't add enough towards the plot to need to all be included here in such detail. It seemed to me to be too much piled all in one place - the middle of the book - weighing it down. To put it succinctly, Jane did way more detecting and experiencing than she did hunting. Now, about characterization... I'm not the first to mention the dramatic difference in Jane between the last book and this one, but I will mention it, because it's important. Jane's still tough and still a fighter, but what the heck was the deal with the waterworks every time she turned around? And not just crying when things got real bad, but crying on Rick's shoulder at one point. Seriously? That's not the Jane we met in Skinwalker. I like that Jane has always been strong enough to acknowledge feeling fear of the vamps and of the fights to the death - she didn't let it stop her, but she acknowledged it. That makes sense to me, but the crying thing just...doesn't. She was introduced way more as a kill-first-and-don't-bother-to-ask-questions-later type than she ever was a cry-when-the-night-is-blackest sort. It didn't play well with what little we know of her from Skinwalker. And crying on Rick's shoulder is a weakness Beast would've hacked at, an admission that wouldn't have been allowed. I don't get it. And I don't get how the relationship between Jane and Rick evolved, either. I could've seen it happening in the previous book, but any and all sexual tension between them seemed to have been written out of this one, which make the events between them toward the end a bit of a mystery. But those are just the issues that I had a problem with...I still rated the book four stars because I really like the world Faith Hunter created here. The plot to Blood Cross is layered and intense, disturbing and dangerous. I like the characters, and I really like that we get to see a lot of the secondary and tertiary characters from Skinwalker back again. I think the mythos is unique and delightfully original, and I like that the vamps aren't even close to good guys, but they're not all quite bad guys either. This is a very gray-area sort of book, where the villains and the heros both are a bit tarnished, a lot jaded, and ultimately...predators. May the biggest teeth win.